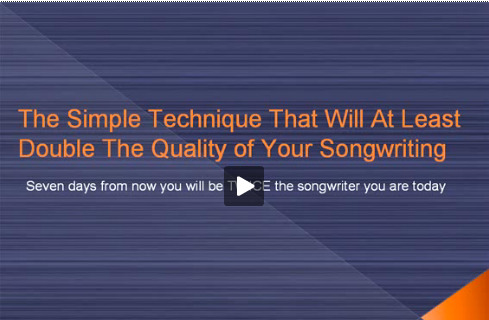 I’d like to share with you the songwriting tools that are crucial if you want to become an excellent songwriter. Now, what I’m NOT going to do is list every single thing you may need in the song writing process. Instead I’m going to list the tools that are absolutely ESSENTIAL to writing a good song. You will already have some of these tools, but in some cases you will find you can improve the way you use them. And this will allow you to compose much better music and more fascinating lyrics. Ok, firstly if you’re going to unleash your absolute full potential as a musical artist, you need to understand how to “tap into” the vast amount of creativity that exists within you. Your “creativity” while not a physical thing, is a song writing tool that is absolutely essential to writing good music and lyrics. If you feel you have more creativity within you that you’re not currently using, you can use this course to learn how to master this area. And when you do you’ll find that you’ll constantly be living in a flow of inspirational musical and lyrical ideas! It’s an amazing way to live, and I know you‘ll enjoy it thoroughly. The second tool that’s essential to great song writing is a recorder. It doesn’t need to be a sophisticated recording device… something simple will do the trick. Here’s why you need to have a recording device in your arsenal of songwriting tools. We as humans get the best results in any area (especially creative areas such as song writing) when we have a steady flow of FEEDBACK to learn from. If you can find a way to “monitor” your songwriting efforts, you’ll improve quickly. And having a recording device on you at all times is the easiest way to do this. Here’s what I recommend. When you sit down with your instrument to create some song ideas, set your recorder so it records the entire session. This way you can “let go” as you create, knowing full well that if a good idea comes up, you’ll capture it with the recording device. Doing this is both wonderfully enjoyable, and also will increase your creativity as you won’t be constantly “judging” the ideas you are creating. Instead you will create freely, with no effort being made to “remember” the good ideas as they come by. The last of the songwriting tools crucial to songwriting is your instrument. It’s important to always try and get your instrument sounding as good as possible when you are trying to create something. This way, when you’re listening back to the recording of your creative song writing session, you’re far more likely to recognize a good idea when it comes along. All too often, a good idea will be overshadowed by a terrible sounding instrument… If your instrument doesn’t song inspiring, try and tweak it and get it sounding as good as you can. When you do this, you’ll find it far easier to create good musical ideas… and you’ll also find it easier to recognize when you’ve created a good idea.Click Here To Discover Songwriting Tools That Will Release Your Inner Songwriting "Genius"